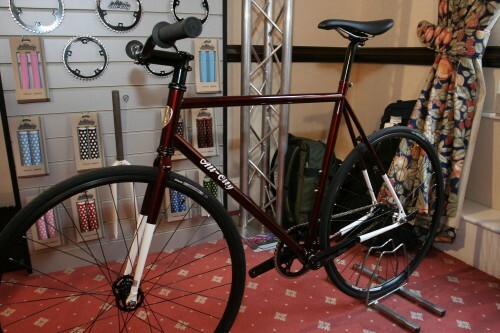 Fixed bikes were well to the fore at last week's Core Bike show with a really interesting selection of machines reflecting how diverse the one geared bit of the road cycling world is becoming. We've already showcased the track classicism of the fixed version of Colnago's Master X Light and featured the new line of Traitor bikes here and here, so let's take a look at what was on offer from Cinelli, All City, Light Blue and Identiti. We saw Cinelli's fixed bikes at Eurobike and now they're over here in the shape of the Gazetta frameset and the Mystic Rats… (well it's got to be better than White rat or indeed Lab Rat). At first glance these look like similar bikes they are in fact very different. The Gazzetta is to use that over-done phrase a classic steel frame given a modern twist, while the Mystic Rats is made from Columbus 6061 aluminium and could be said to come at things from the opposite directin a modern bike with a classic twist. In fact the closer you look the more the differences you see, the Mystic Rat comes with a with white straight-bladed painted carbon fork, with an alloy steerer. White chain, white stem white Cinelli cork bar bar tape, erm white Cinelli Unicator saddle, white bullhorn bars… you get the rather monochrome picture. Drivetrain is a 48T Sugino Messenger crankset matched up to an 18T flip flop rear hub. Oh, yes, the wheels are Alex 28s… in white with white Vittoria Zaffiro tyres. It's not all white though, the seatpost, hubs and headset are black… just so you don't lose your bike in a snow storm or indeed have people leaving flowers by it every time you park up. It's yours for £779.99 and is available now to find out more visit www.chickencycles.co.uk. By contrast the Gazetta is micro tig welded steel frame with, as it's other concession to modernity, what Cinelli describe as an MTB-style segmented fork – suppose that does count as modern compared to a classic track frame design, whatever it's a lovely piece of work and while it may be made like a rigid MTB fork it's got 32mm of rake which brings it into line with the track geometry elsewhere on the Gazetta. Like the rest of the frame the fork is made from Columbus chromoly steel. In Italy the frameset is available with everything bar the wheels and drivetrain – over here it is a more standard frameset package of frame fork and headset for £449.99. Given the track angles 74.5° for the head and seat on the large size matched up to a tight 95.7cm wheelbase handling is going to be at the sharp end of the spectrum with fairly instant delivery to the back wheel courtesy of short 39.2cm chainstays, that also equates to instant feedback from the wheel when riding in fixed mode. 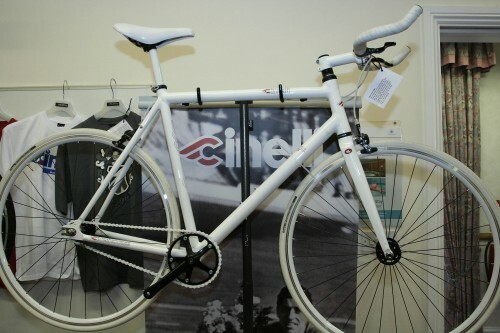 Cinelli describe the Gazetta as being set up for the demands of “fast and ambitious urban and amateur track cycling”. The range of colours will certainly stand out on the street that's for sure. While there's no doubt the Mystic Rats will be a fast handling nippy bike it should be a slightly more relaxed ride than the Gazetta; the head angle is slightly slacker at 73° for the large and the wheelbase is a tad longer too, but at 96.6cm it's still going to be easily nippy enough for darting through city traffic. If it were fitted with riser bars it would be more upright too, both the effective and actual top tube measurements for its sloping frame are shorter than the horizontal top-tubed Gazetta at 55.5cm and 54.5cm respectively – those bullhorn bars will stretch things out though. Power delivery will still be rapid but the chainstays at 39.2cm are heading out for road bike length – even if they don't quite get there which should make for a slightly smoother delivery to the back wheel it should also help add stability too. It would be interesting to ride one with risers though to compare the difference. And the reason for the relentless whiteness? Well Cinelli's Bootleg series of urban, rat-named bikes have always been black, occasionally with leather tassles too. This is different see? Check out the blurbe below from their website to get an idea of how different. For more pictures of Cinelli's fixed bikes click this Cinelli fixed tag or the one at the bottom of the story. I'll have a pint of what he's on! …On second thoughts, better make that a half. Like Traitor who we featured last week and in our first CORE report, All City are a boutique brand from North America that's new to the UK. Traitor are from Canada while All City hail from just over the border in Bloomington, Minneapolis. All City's complete bike range is best described as small but perfectly formed – right now it amounts to the Big Block. Whatever its name the pictures don't do this baby justice – the TIG welded frame is a thing of beauty, the finish is superb – not sure how it's going to hold up when you stick a couple of brake cable clips on that top tube, but there 's plenty of paint on there and you could always zip tie 'em on or run without a back brake – plenty of people will. Nice touches include the chainstay bridge being shaped like an actual bridge, a brick built one over the Mississippi apparently and bridge fans will be pleased to know that there's another one on the headtube too, and is that a bridge on the rear drop out too?. 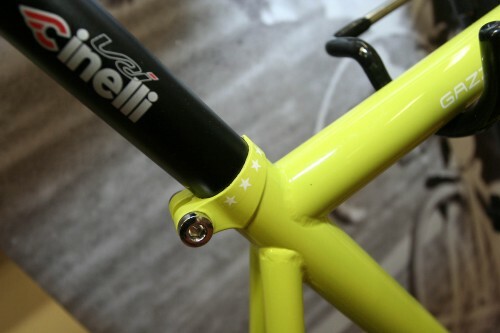 All City may be new but like Cinelli they take a classic approach to track bikes, the frame is 4130 chromoly – All City say that tube diameters and butting profiles vary between sizes – although like Cinelli's Gazetta the chainstays are the same length in every size. 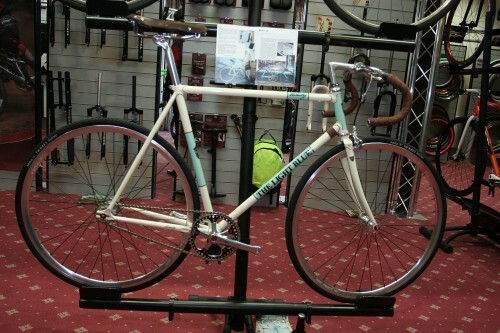 Also like the Gazetta this is a bike that's intented for road or track use – so the bottom bracket is in the track style higher than you'd find on standard road bike. No surprise either that frame geometry is pretty much identical to the Gazetta – the All City has a slightly longer wheel base due to an extra centimetre in the top tube. Radical. Bottom line is we're talking a fast handling and agile machine, if the Big Block performs the way the geometry says it should. The complete bike comes built up with All City's own hubs and 46:17 crankset and rear sprocket. Handlebars are of the riser variety matched up to a tidy looking four bolt stem and a very decent Cane Creek S3 headset. Like most bikes of the type the bottom bracket is old school square taper although All City claim a 100g weight saving over similar bottom brackets due to the quality of their bearings. If you like what All City do there's a range of parts and accessories you might like to cast your eye over also, that crankset can be bought as a standalone item from UK distributor, Ison, yours for £100 and they also do various other ring sizes, including 130 messenger rings, although no 130 cranks as yet. There are also All City grips and coming soon another complete bike, the Dropout a freestyle fixed currently available as a frameset. 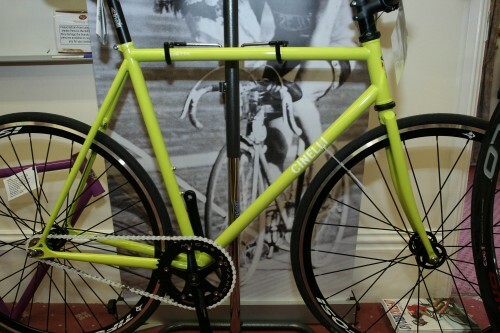 The Big Block costs £375 as a frameset or £800 as a complete bike and will be available from Ison Distribution from mid-March. Which brings us on to Identiti and Light Blue, Ison's two in-house fixed/singlepeed brands which between them nicely sum up why Ison have more than a passing connection with making fixed bikes. Ison boss Lloyd Townsend's family have been involved in the bike business pretty much since the bike was invented, they were the Townsend in Townsend Bicycles and from their Cambridge shop produced a bike called the Light Blue over a 100 year ago – hence the Centenary bike with that mighty front chainring. All that has evolved into Ison a company with deep roots in the UK BMX and dirt jumping – a scene from which many original fixed riders came – a natural progression then for their Identiti brand famous for its sorted jump bikes to start producing fixers too while the Light Blue name which first returned on a line of city bikes sold locally in Cambridge now graces this classically-styled lugged fixie, the Trinity which we first got a glimpse of at Eurobike. Although production versions are now on sale the bike pictured above is the Eurobike prototype. Production models are available as a limited edition of 100 numbered framesets using Reynolds 90th Anniversary limited edition 531 tubeset – they don't make it any more y'know and the Light Blue uses the last of it. In fact some of the sizes are non-standard – the seat tube is drlled out to take a 27.35 seatpost which is suppled as part of the frameset – probably not an item to lose or let rust in to the frame. The hook-up with Reynolds and the idea for the bike came after a chance meeting at an airport and it took two years to get all the frame details just right before they went in to production. Trinity production frames are fully lugged and use matching classic lugs all-round, the fancy bottom bracket lugs on the prototype were simply all they had at the lug factory said Lloyd. Light Blue frames are available in a choice of cream or a mettalic dark blue with the light blue, er Light Blue decals and without the prototype's painted seam. A Light Blue frameset will cost you £559 and that includes headset, Nitto stem, and a triple butted steel fork plus that 27.35 seatpost. You might need to hurry though because 50 of the 100 have already gone. It may come from the same stable but the Identiti Personna is a very different bike from the Light Blue. This is the modern fixed machine at it's most evolved in terms of geometry and strength. It can be built up in one of two ways, either as an urban messenger-style machine or as a fixed freesyler – essentially a freestyle BMX machine translated to a 700c format, a bike for throwing some interesting shapes on. Indentiti built it's reputation making tough four cross bikes and that stands them in good stead here, the Personna has a sloping top tube, for more “room and manouverability” say the ID boys (trans: if a jump or trick goes wrong you want plenty of space between your family jewels and the top tube). Compact geometry also makes for smaller, stiffer and stronger triangle at the back extra strength is added at the front by an open tail down tube box gusset – and although strength is high in the mix, that isn't completely at the expense of weight the frame is made from double-butted TAF chromoly. Frame weight for a medium is a claimed 2,305g, (5.1lb). It's a longer frame too, contrast the 41cm chainstays here with the much shorter classic track geometry ones on the All City and Cinellis, that should add in some stability crucial if you are really throwing a bike around, we're guessing too that the head angle will be slackened a tad too to add some length to the wheelbase… and make bar spins easier. “Put very simply, the dropouts have a 1.5 degree tapered thickness, and special washers also have a matching 1.5 degree taper to keep parallel faces. 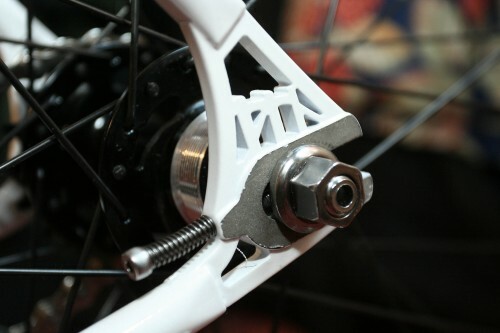 As mentioned the Personna is available in a choice of builds the main difference being that wheels, bars, stem and most of the finishing kit on the Freestyle (pictured above) is by Gussett and built for strength, so Halo Aerowarrior wheels replace the Halo Aerotracks on the Urban and the Twin Rail Courier tyres are 38Cs rather than the 29s on the Urban. It's Gusset: Pinhead pedals, cranks, 4 Poster seat post and Open Prison bars for the Freestyle oh, and let's not forget the wonderfully named Gusset Slim Kev saddle while the Urban gets Gusset Singles Bars, Genetic Tibia cranks and Drift pedals, a Gusset R-Series saddle and Identiti T4 seatpost. Both bikes bikes are available in Matte Black or Metallic Orange for the Urban, or Chrome Plate for the Freestyle. Sizes are Small: 49.4cm; Med: 51.4cm; Large: 53.4cm. The Urban sells for £650 while the Freestyle is £750. For more information on the All City Big Block, Light Blue Trinity and the Identit Persona visit the Ison Distribution website.